We have been looking at some of the work of Andy Warhol. He was born on August 6, 1928 and died in 1987. 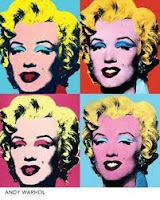 He was an American and a leading artist in the pop art movement. We decided to make some self-portraits in the same style. First of all we traced our photos. Then we copied them four times onto one piece of paper. Next, we coloured them in using either fluorescent felt tipped pens or crayons. Finally we went over the lines in black felt tip so that they would stand out. 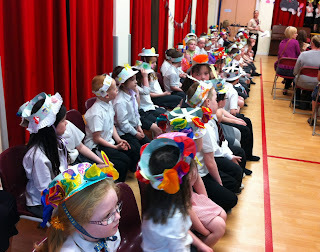 As we are heading towards the Easter holidays, we held our Easter Bonnet Parade today. Primary 1, 2 and 3 sang songs, recited poems and showed off the Easter bonnets they had made in class to their family and friends. Everyone thought they sang 'Hosannah' beautifully and if you are going to the Church on Friday you will be able to hear it again!